This turbo kit is NOT COMPLETE turbo kit. This kit is for customers custom make or DIY project. 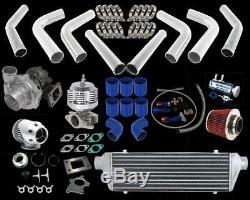 Customers also need to custom make the turbo manifold and downpipe for this kit. This turbo kit can gain 80-150 HP if it sets at 7-15 PSI. Downpipe Flange: 2.5'' 5 Bolts Flange. Type of Bearing: Journal Bearings. Cooling Type: Oil Cooled Only. Turbine Wheel Diameter: 54.06MM/65.20MM. Compressor Wheel Diameter: 50.16MM/76.84MM. 27''X7.0''X2.5'' Front Mount Intercooler. Brand new universal 27''x7''x2.5'' front mount intercooler. Made of high quality T6061 aluminum. High flow and light weight. Support up to 400HP and 35PSI. Compress air flow rate: 700cubic feet/min. Pressure drop: 0.2-0.5 at 15PSI, 2-5 at 35PSI. Full size: 27''x 7''x 2.5''. Core size: 21''x 7''x 2.5''. Universal 2.5'' Piping Kit. Brand new universal 2.5'' polished aluminum piping kit. This is great for turbo DIY project. Customer need to cut and bent the pipe to fit your car. Brand new universal 38mm wastegate, made of hight quality stainless steel hardware, mating weld flanges are 304L. Set at 7 PSI, comes with two extra 11PSI and 15PSI springs, fully adjustable. Only 4.35'' tallgood for customer working with tight engine compartment. Accurate boost pressure, Ultra durable diagram. Turbo Blow off Valve Bov. Brand new turbo blow off valve bov. Made of high quality CNC billet aluminum and andized finished. Including O-ring, hardware and flange. Our blow off valves is a dual stage pull-type relief valve. Unlike typical push type blow-off valves, will not leak under any level of boost. It is for maximum performance, incorporates both a small primary valve for ultra quick activation, and a larger secondary valve for additional discharge capacity. It is constructed of billet aluminum, which ensures long-term durability and a high luster look. Brand new 10AN oil drain/return line kit, made of hight quality stainless steel braided line and T6061 aluminum fitting. Helps circulate oil from the turbo to the oil pan. Brand new oil feed line, made of hight quality stainless steel braided line. Special designed inlet adapter limits oil flow, effectively prevent blown oil seal caused by excessive oil pressure. Comes with one 1/8 NPT male fitting and one 4AN male fitting. Has restriction build in, offers proper oil feeding to the turbo charger. Brand new turbo boost controller. Made of high quality CNC machined T6061 aluminum with anodized finish. Comes with hardwares for easy installing. Allow you to adjust PSI ratings(1-30PSI)without changing the wastegate springs as well as replacing the wastegate springs. 100% brand new, Never been tried or installed. Made of High Quality T-304 Mild Steel Durable Material. Fits T3 2.50" X 2.00" Turbo/ Turbocharger Flange. No instructions included, Professional installation is highly recommended. Item exactly the same as picture shown. Professional installation is highly recommended. Additional charge might be required!! For Canada Buyers are responsible to pay for custom duty that is charged by Canada government. Because we always test fit our products, it is rare that our item will have fitment issue. If in case the item you receive does not fit your car, we need to ask you for digital picture so that we can assist you. We offer a wide variety of products buyers want at the lowest prices. Every item is in stock and carefully packaged by our staff and is given our personal attention to ensure it is processed accurately and quickly. Powered by Solid Commerce The All-in-One Listing, Inventory & Order Management Solution. The item "SUPER POWER 70HP+ UNIVERSAL T3/T4 TUBO TURBOCHARGER KIT FOR CAR TRUCK VAN" is in sale since Tuesday, January 3, 2017. This item is in the category "eBay Motors\Parts & Accessories\Car & Truck Parts\Turbos, Nitrous, Superchargers\Turbo Chargers & Parts". The seller is "karobskollection" and is located in Rowland Heights, California. This item can be shipped to North, South, or Latin America, all countries in Europe, all countries in continental Asia, Australia. Interchange Part Number: UNIVERSAL PIPING KIT, MODIFICATION IS REQUIRED!